Rubin is coming off an injury-free year in which he won two Challenger events and is off to a good start this year. 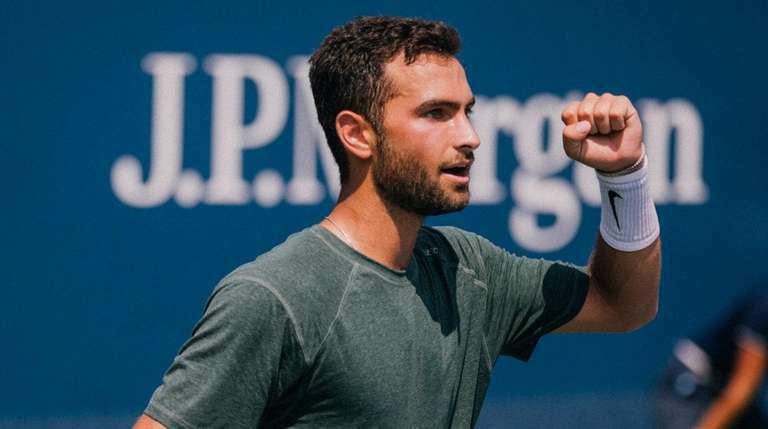 Noah Rubin was tired at the end of the 2018 tennis season. A good tired, to be sure. He finally got in a full year of tennis, mostly at the Challenger level, but he did get into ATP Tour level events and the French and U.S. Opens. One of those ATP events was the inaugural New York Open at NYCB Live’s Nassau Coliseum, where he was given a wild card, and he’s gotten one again for the tournament that begins on Monday. Rubin, of Merrick, will turn 23 soon after the New York Open and last year was the first time he was injury free after becoming a pro following his freshman year at Wake Forest in 2015. Ankle and wrist problems caused him to miss significant time and significant experience. Rubin was 4-6 in ATP Tour level events, and that included a victory over the No. 1 American player, John Isner, at the Washington, D.C., event after losing to him in three tough sets in the first round of the French Open. Isner also will be in the New York Open field. Rubin won a Challenger tournament in Noumea, New Caledonia, at the start of 2018 and another in Tallahassee, Florida, in the spring. The Tallahassee victory was key to him earning a wild card into the French Open. He went back to Noumea and lost in the final this year, not a bad start to the season. Each tournament, each result can be a stepping stone to being a successful professional. And a perfect place to put it on display will be Nassau Coliseum. “Playing at a place I’ve been at my whole life, whether it’s the circus or Islander games, to be the one featured and bringing out the fans is a really great experience,” Rubin said.